Nikolay Borchev | The Chamber Music Society of Lincoln Center. Baritone Nikolay Borchev has established himself as a regular guest of the world’s most important operatic, concert, and recital venues. He began his career as a member of the ensemble of soloists at the Bavarian State Opera. After several seasons in Munich, he spent two seasons as a member of the Vienna State Opera. With both companies he sang numerous main roles including Papageno in Mozart’s Die Zauberflöte, Guglielmo in Mozart’s Così fan tutte, and Figaro in Rossini’s Il Barbiere di Siviglia. His recital repertoire is extensive, and encompasses cycles by Beethoven, Schubert, Schumann, Mahler, and Wolf. He sang Schubert’s Die Winterreise (released on CD) at the Mecklenburg-Vorpommern Festival. 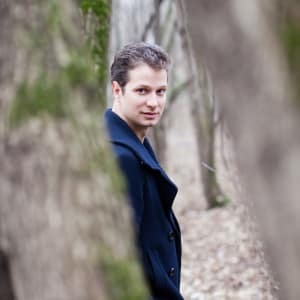 He is a regular guest of Vilabertran’s Schubertiade, and has given recitals at Dortmund’s Konzerthaus, the Palais des Beaux Arts in Brussels, and at the Weimar festival. Recent highlights include his role debut as Conte in Le nozze di Figaro, debuts at Opera Stuttgart with Eugene Onegin, Opéra de Lyon as Dandini in La Cenerentola, and Opéra du Rhin Strasbourg as Mercurio in La Calisto. Current and future projects include his role debut as Posa in Don Carlo and as Fritz in Die tote Stadt. Born in Pinsk, Belarus, Mr. Borchev studied at Moscow’s Tchaikovsky Conservatory with Pavel Lisitsian und Maria Ariya and later attended the Hochschule für Musik "Hanns Eisler" in Berlin under the guidance of Heinz Reeh, Júlia Várady, and Wolfram Rieger.